Description: A crowned four-pointed star with crossed swords and a wreath of oak leaves, having the royal cypher at the foot and a central scroll inscribed AUG NOV 1914. Comments: This medal was awarded to those who had served in France and Belgium between 5 August and 22 November 1914. 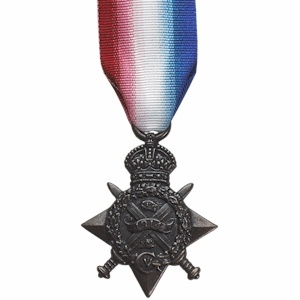 The majority of the 400,000 recipients of the star were officers and men of the prewar British Army, the "Old Contemptibles" who landed in France soon after the outbreak of the First World War.